← Unique Train Ride & Hatchery Tour! 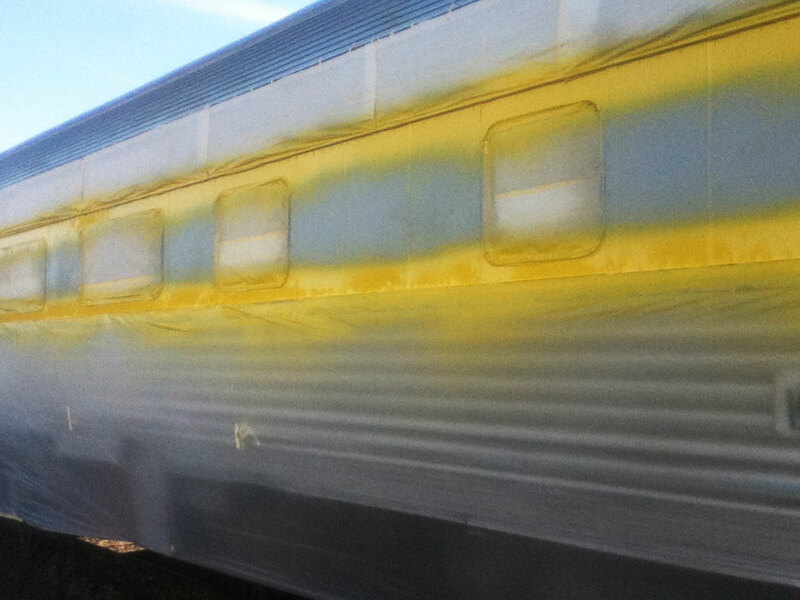 During the recess between summer and fall seasons, the Eagle Cap Excursion Train will receive a long-awaited paint job. The stripes on the passenger cars, currently a dingy black, will be painted bright blue with yellow accents to match the engines and the silver will be freshened. Crisp Colors of La Grande is doing the masking and fine work at a discounted rate. Volunteers with the Friends of the Joseph Branch will assist with prepping and painting the silver portions of the cars. In addition, Mike Hillecke will acid wash the cars and engines. The project is being coordinated by the Friends of the Joseph Branch, with board member David Arnold heading up the project committee. Funds have been donated from private and business sources, including generous gifts from Anderson Perry & Associates, Bearco Enterprises, Stephen Adams and Baretto Manufacturing. Also helping fund the project are the Friends of the Joseph Branch and a grant from the Union County Discretionary Fund. “Our organization has been working toward the goal of painting the train for many years. We have done a lot of work inside the cars, so repainting the exterior will better reflect what is inside,” said Ed Spaulding, President of the Friends of the Joseph Branch. “The train will be much more attractive in photos – a favorite pastime of rail fans from all across the continent. It will draw more attention in advertising and marketing materials and on the Internet, as well, and ultimately bring more passengers. The fall season will get under way September 13, with guest historian Harlan Scott on board to share the history of the Joseph Branch and its surrounding countryside. On September 27, highly regarded local photographer Eric Valentine will be on board to offer tips and advice for taking great train and scenic photos. Passengers will have the opportunity to get off the train and photograph a “drive-by” at the Rondowa Bridge. The October 11 train is a target of the notorious Gold Rush Bandits and the October 18 train ride features the amazing fall foliage along the Grande Ronde and Wallowa Rivers. Get your tickets by calling Alegre Travel, 800.323.7330 or 541.963.9000, or by email to train@alegretravel.com, or stop by the office at 1307 Adams Avenue, next to JC Penney’s in downtown La Grande. Donations for the project are welcome and tax deductible. The Friends of the Joseph Branch is a 501-c-3 non-profit organization that manages the excursion train business and depot, works to promote and facilitate enjoyment of the Historic Joseph Branch Railroad (now called Wallowa Union Railroad), and preserves and presents the history of the Joseph Branch. Wallowa Union Railroad is owned by Wallowa and Union Counties. Contact David Arnold, pickandbow@aol.com to contribute. This entry was posted in Events, Home, Uncategorized and tagged Crisp Colors, Eagle Cap Excursion Train, Elgin train, new paint, scenic train, train rides. Bookmark the permalink.